Apex has sent along the table of contents for the upcoming anthology The Book of Apex: Volume 3 edited by by Catherynne M. Valente. You’ll encounter strange, compelling magics interwoven within a haunted book made of vegetation, cities that come to life and go to war, and surreal suburban nightmares played out through the eyes of children. 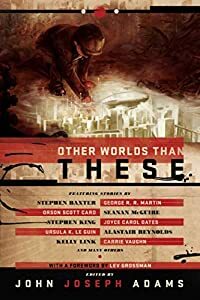 The Book of Apex: Volume 3 contains work by Seanan McGuire, Saladin Ahmed, Theodora Goss, Forrest Aguirre, Cat Rambo, Ian Tregillis, Annalee Newitz, Peter M. Ball, and many other masters of the short form.